Sweden did the same denouncing the ruling, with the Prosecutor Marianne Ny giving a Press Conference offering no new information with the sole purpose of attempting to spin the narrative her way. Monarchies UK and Sweden have been dancing the tango for six years in full regalia with unmatched arrogance. It has taken the courage of Ecuador, a Republic, to democratise the dance and force them to jump to a different tune. In 2012 the political asylum granted by Ecuador protected Julian Assange’s life and work. Then in 2015 the efforts of Julian Assange’s legal team forced the prosecutor to accept to question Julian Assange in the Embassy. In 2016, Ecuador, consistent with its obligations as granting political asylum,established a Mutual Legal Assistance Agreement with Sweden that will allow them to participate in the Swedish legal process. Finally the tango dance is over! 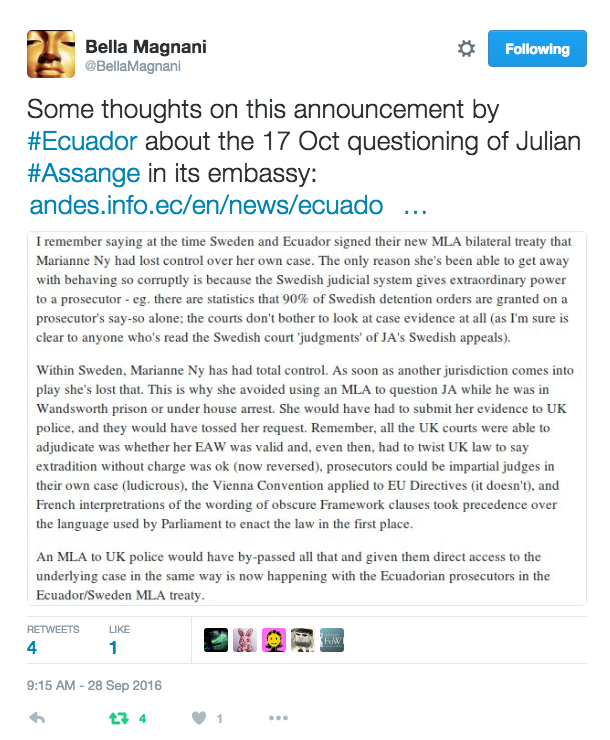 “The questions Swedish prosecutors will ask Mr. Julian Assange are already in the office of international affairs. This does not limit the possibility of having Ecuadorian attorney general ask his own questions,” the official said.